It feels like everyone’s travelling to Seoul these days. Go ahead, pop onto your Instagram feed. You’ll see #OOTDs in hanboks, the girly interiors of the popular Stylenanda Pink Hotel or a visually arresting art installment in Gentle Monster, maybe even someone’s massive k-beauty haul. Dare we call it the new Tokyo? 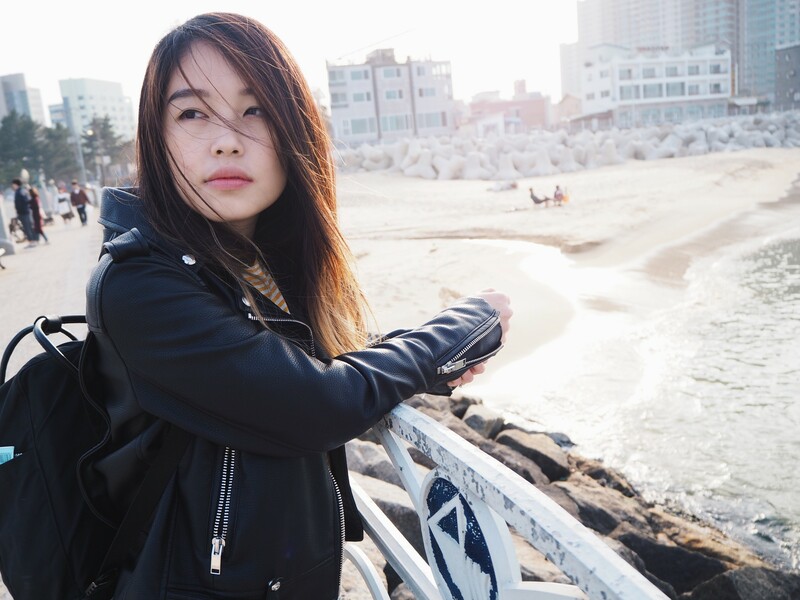 The Asian destination has garnered immense popularity, thanks to its triple whammy of great food, everything from quaint cafes to fried chicken and barbeques; a vibrant shopping scene, both on the k-beauty and fashion frontiers; as well as its incredible pop culture significance — yes, your k-pop and k-dramas. Consider this: the word oppa has creeped into many a Singaporean’s common lexicon — and heart. 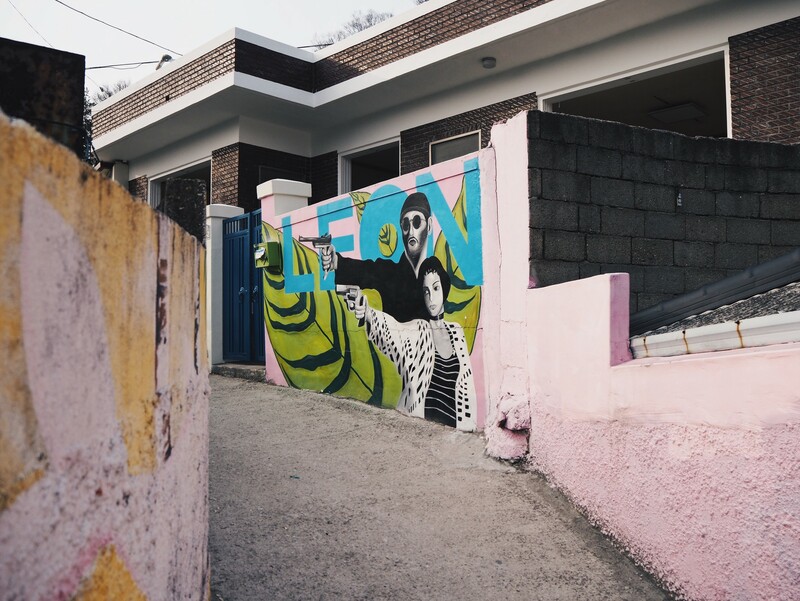 Whatever your reason to travel to Seoul, there’s always a new hip enclave to explore. 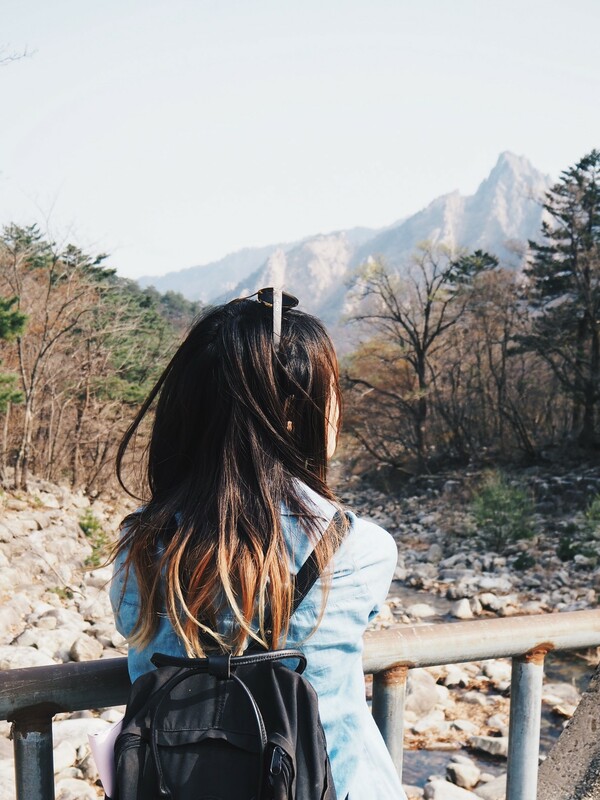 But what if you’re looking for more than your average Seoul vacation? 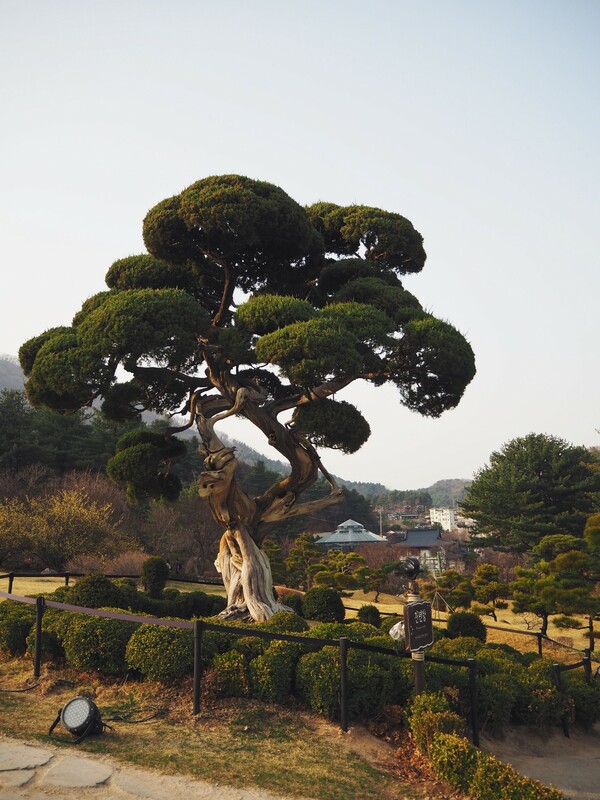 Sure, the endless shopping, tucking in to comforting budaejjigae, and hipster café hunting has its draws, but it’s also not all South Korea has to offer – plus, there has to be a limit to shopping and eating right? Yep, even for me. 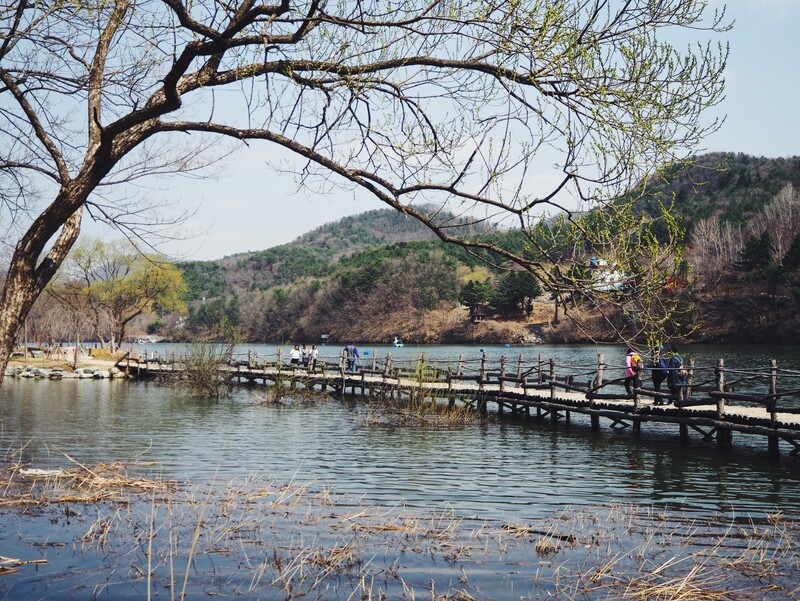 For a more varied take on South Korea, try taking a day trip outside of Seoul. 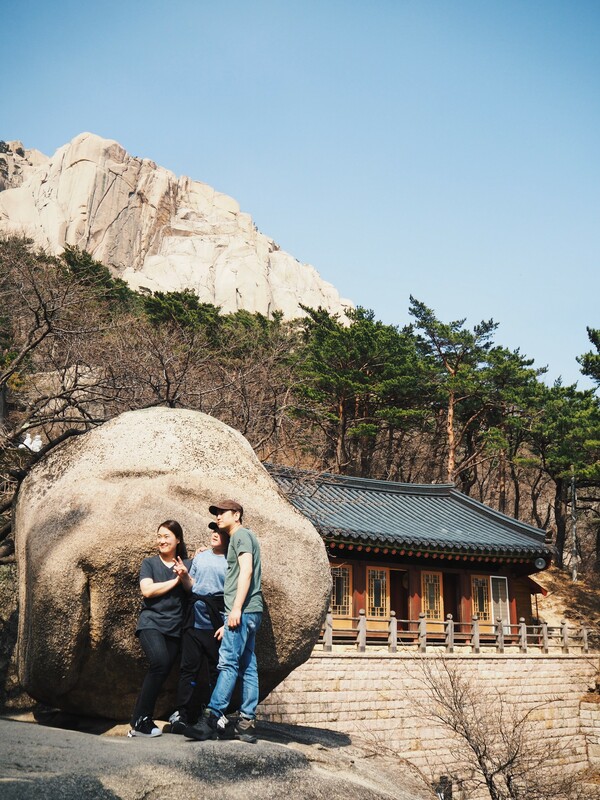 These don’t have to cost much, nor do they take more than 3 hours of travel for a whole different experience – essentially, you can leave and return to Seoul comfortably, all within a day! Here are the 5 day trips I actually did, just to show you how it’s totally feasible too. 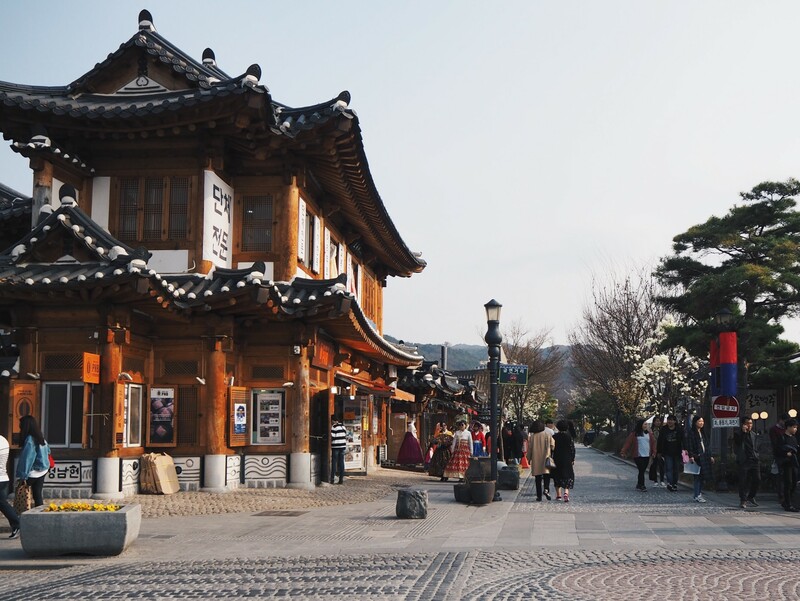 So you’ve been to the Gyeongbokgung Palace and Bukchon Hanok Village in Seoul, and left feeling awed by their historical significance and charm – how about an entire village then? 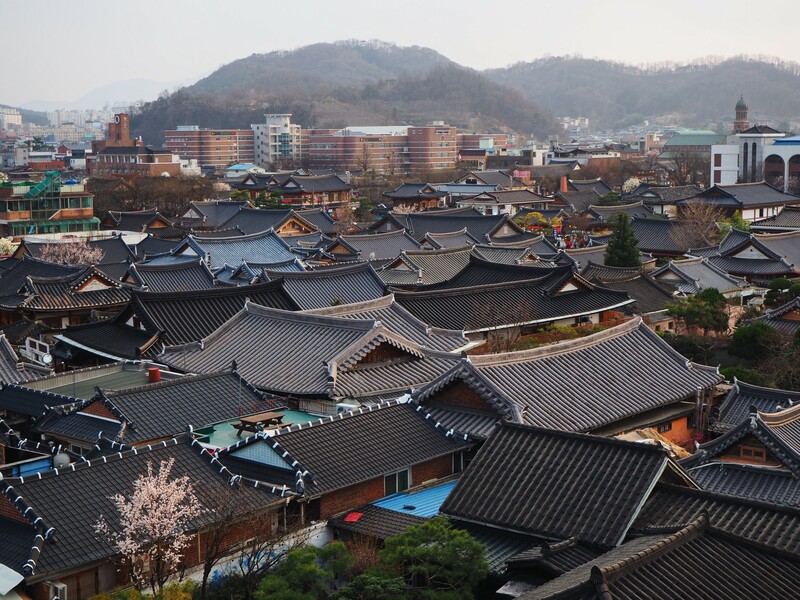 The city of Jeonju is located less than two hours away by train, and is famous for the Jeonju Hanok Village, a historical area that still retains the beautiful architecture of over 800 traditional Korean hanok houses. Being here and reveling in the old school sights is definitely a good change of pace from the bustle of the city. 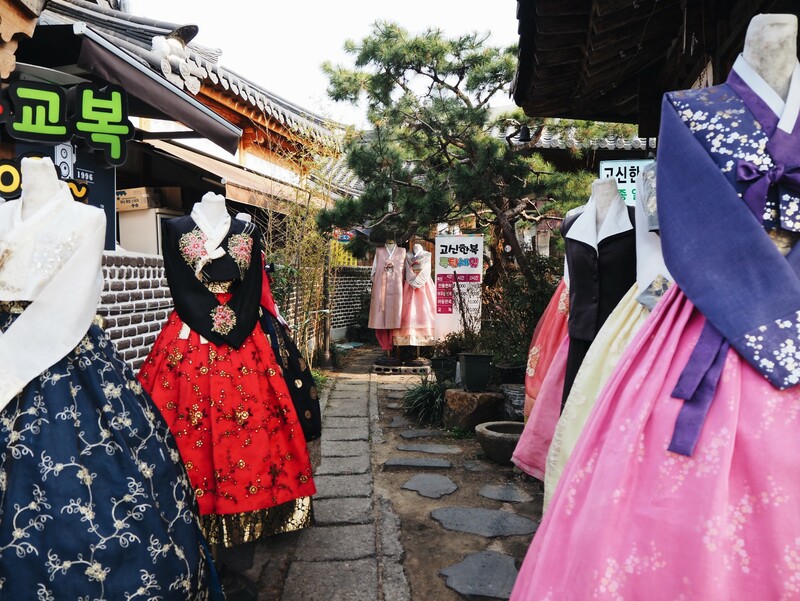 There’s plenty to do and see here, though the best way to find out is by aimlessly wandering about the area and its cobblestone streets – you can enter the Hanok Life Experience Hall to gain valuable insight into traditional Korean life, stumble into wine or kimchi museums, or simply rent a hanbok and experience how it’s like to walk around in the traditional embroidered dress (and score some great #OOTDs along the way). Don’t worry you won’t feel out of place, everyone’s in one and armed with a selfie stick – in fact, I felt out of place not wearing a giant fluffy skirt. 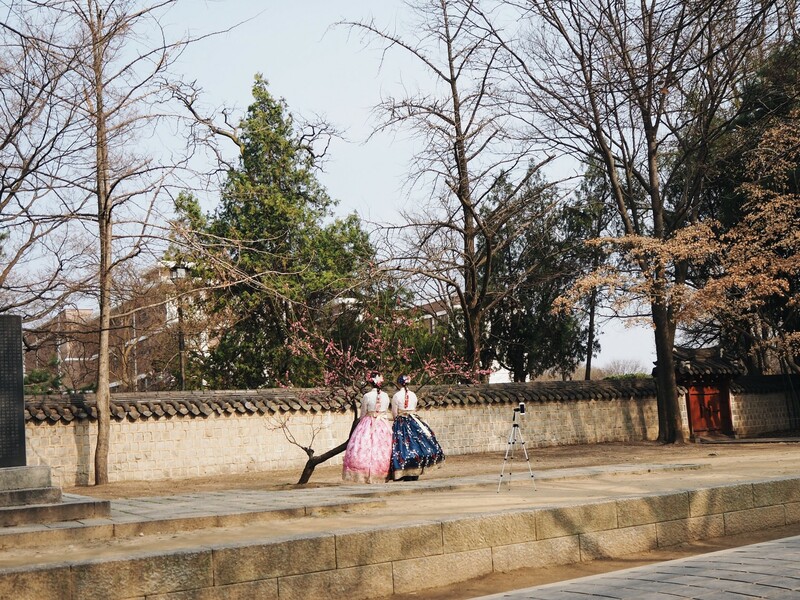 Popular spots include the Gyeonggijeon Shrine and its picturesque grounds, which house the portraits of King Tae-jo the founder of the Joseon Dynasty, as well as the Omokdae and Imokdae pavilions, located on a steep hill that overlooks the entire village. From there, you can also venture across an overhead bridge to the Jaman Mural Village, a small enclave of residential houses atop a ridge, known for their colourful hand-painted murals. It’s basically an outdoor art gallery, now with a maze of winding paths. You might be able to spot some famous characters, including No-Face from Spirited Away, Totoro, or those from Alice In Wonderland. 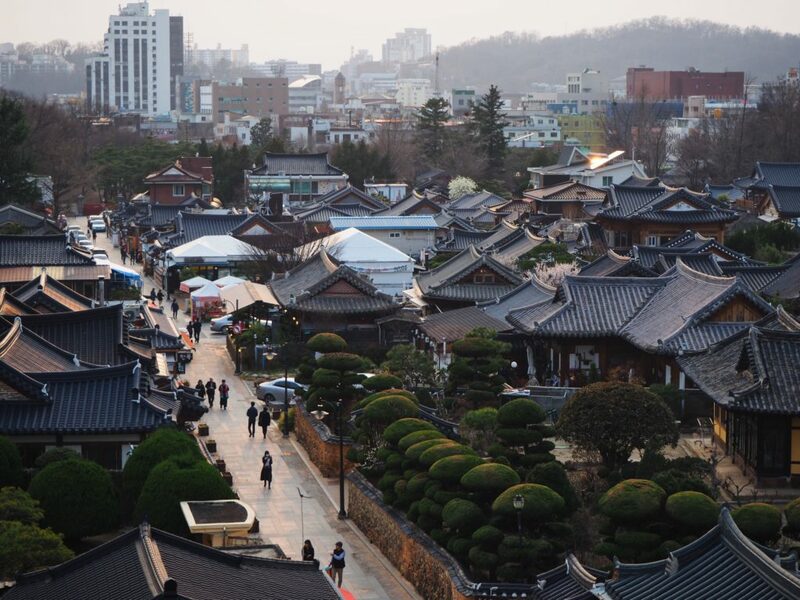 I’ll let you in on the best places to view the famed rooftops of the hanok village. 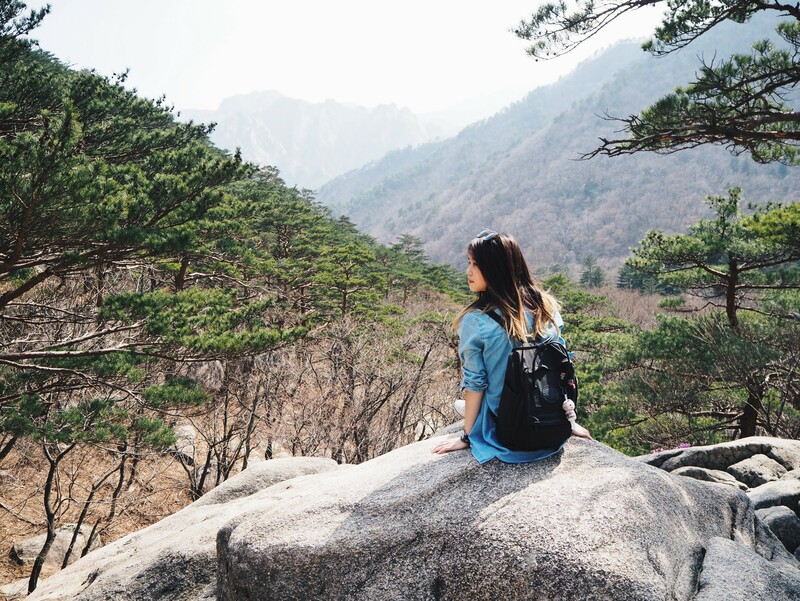 First, take a quick 5-min hike up to Omokdae and you’ll be greeted by a rewarding sight of the entire landscape, and from various angles too – it’s breathtaking to just stand there and take it all in. I took my best photos at another spot though, the second-storey balcony of Cafe 전망, a rooftop café located on a slope. Get an iced latte, then sit on the balcony till dusk for a nice way to end your day. Dare I travel to someplace without being enticed by the food? 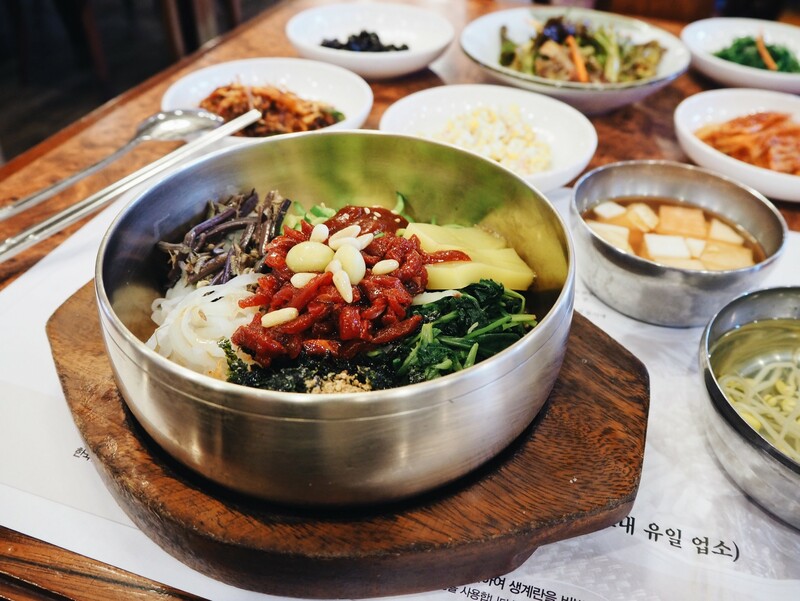 Jeonju’s a little special – its historical significance even extends to local food, and the place is widely considered the birthplace of bibimbap, a Korean dish comprising of vegetables, beef and rice… which doesn’t sound very exciting until you see it served before you. I had my fix at Hankookjib (한국집). Think of this as the healthy rice bowl before healthy rice bowls became a thing – there are many regional varities, but here, Jeonju bibimbap significantly contains locally-grown beansprouts, raw marinated beef (said to be smoother and richer in flavour), along with a range of other ingredients such as gochujang (red pepper paste), namul (seasoned spinach), and mushrooms. Everything’s there to create this ideal balance of taste, texture, and bright contrasting colours, which explains why they’re such IG material. Mix it all in and you’re in for a tasty meal. 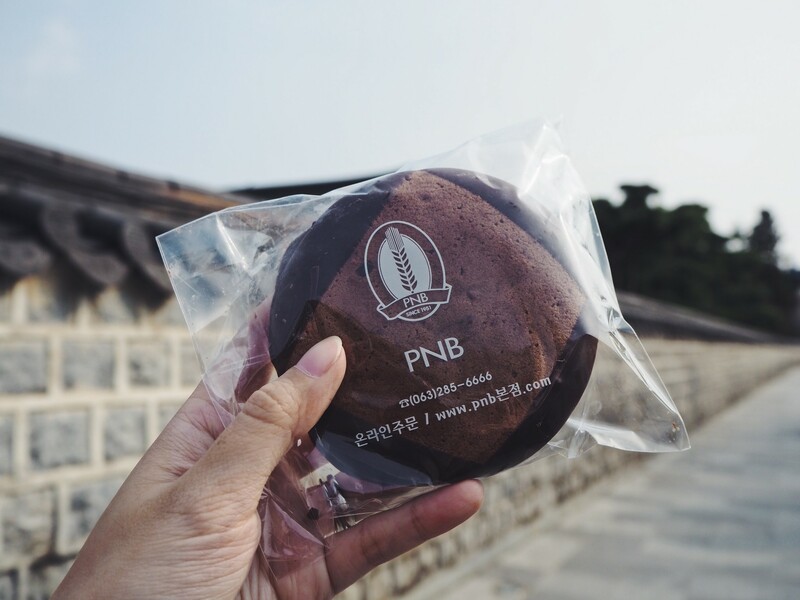 Next up, PNB Bakery, a humble bakery known to be the OG of choco pie, that round chocolate-coated cake with a marshmallow filling in the middle. PNB, or Pungnyeon Jegwa, opened its doors in 1951, and has been mighty popular ever since. You might have to queue for your fix. Indeed, the iconic snack tastes a tad fresher here, with the chocolate exterior perfectly contrasted against the soft texture of the cake sponge. What’s also different is that it’s larger in size, and contains jam in the middle of its sweet cream filling. If you’re travelling on a Friday, book a day tour here ($62.30), inclusive of round-trip transport. 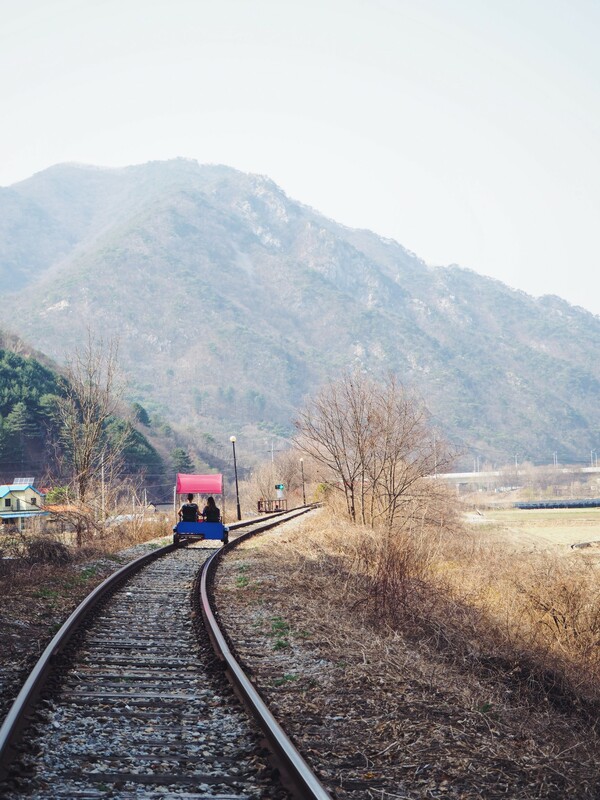 If you’re heading there on your own, the KORAIL train’s your best bet! 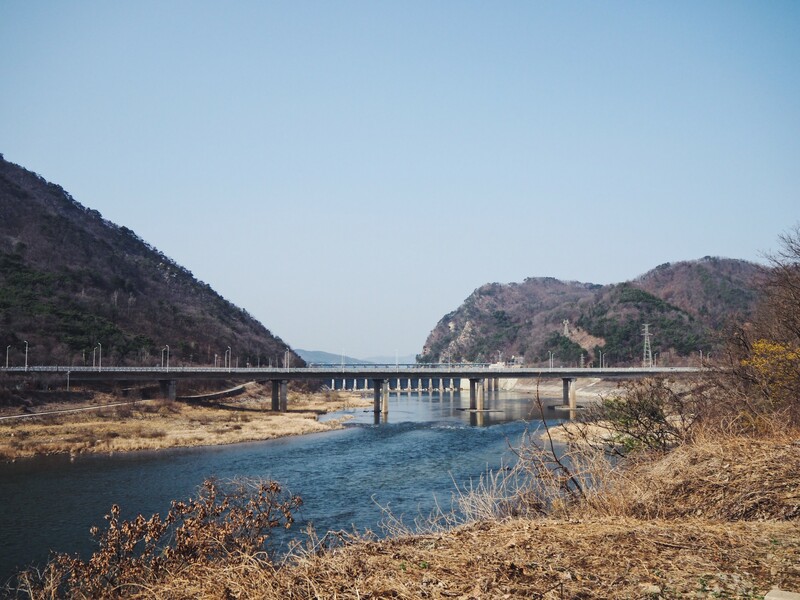 It’s a 1 hour 45 minutes train ride (KTX) from Yongsan Station – Jeonju Station, though you might want to book both your journey and return tickets in advance. Get your Korea Rail Pass here — a Consecutive Day Pass (Saver Pass) starts from $81.40. I’m quite the theme park junkie, and this is my second time here; I have to say though, it doesn’t get old. 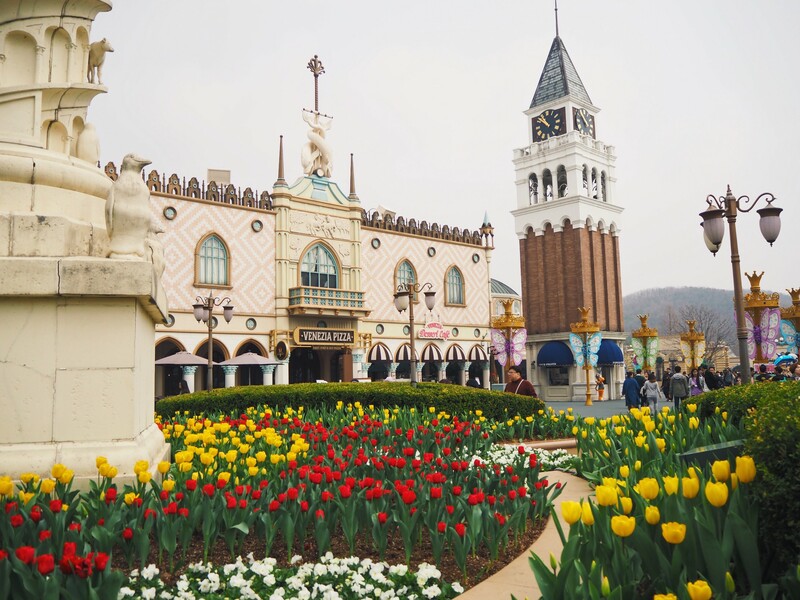 South Korea’s largest theme park is worth a visit simply because of how it feels like you’re in a completely different world here. 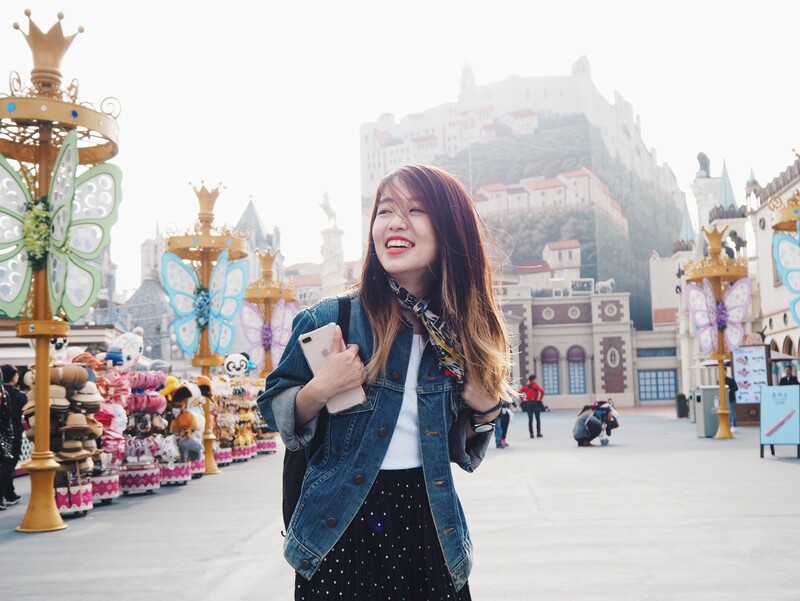 Similar to Disneyland and Universal Studios, the park goes all out with their themed buildings and backdrops – even the parades – so you won’t feel like you’re at your average outdoor carnival. Cue the cheery music too! To get there, book a round-trip shuttle bus service that leaves from popular places in Seoul, and reaches the park in about an hour. Get your tickets in advance, and you won’t even have to queue! The tulips were in full bloom for the Spring season, which made most parts of the park great photo spots, while there’s the entire Four Seasons Garden dedicated to spring flowers including tulips, daffodils and hyacinths. This themed display is updated regularly, so you’ll want to check what’s there when you’re next visiting. Other than that, there are 5 themed zones around the park – Global Fair, where you enter; American Adventure; Magic Land; European Adventure; and Zootopia. Moving on to the highlights – there’s so much to do here, though I’m pleased they cater to the thrill seekers as well. 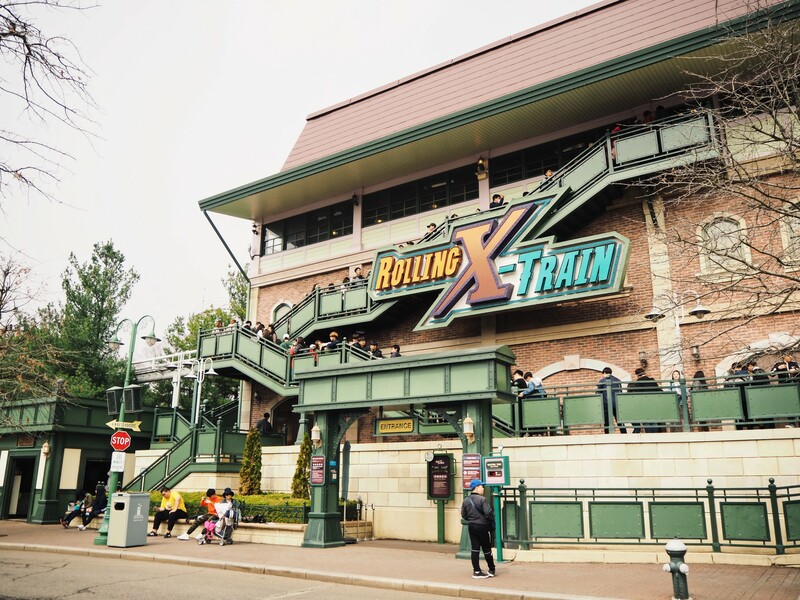 The popular Rolling X-Train, located at American Adventure, and takes you on a super-fast ride with two head-spinning 360-degree loops, which serves as an exhilarating warm-up to the next coaster you’ll encounter. Its neighbours, Let’s Twist and Double Rock Spin, are just as fun if you’re into the feeling of blood rushing to your head. Newer rides also include the Gyro VR, which combines the visual technology and tactile movement to immerse you in a space battle. Hands down, my favourite ride though has to be the T Express. 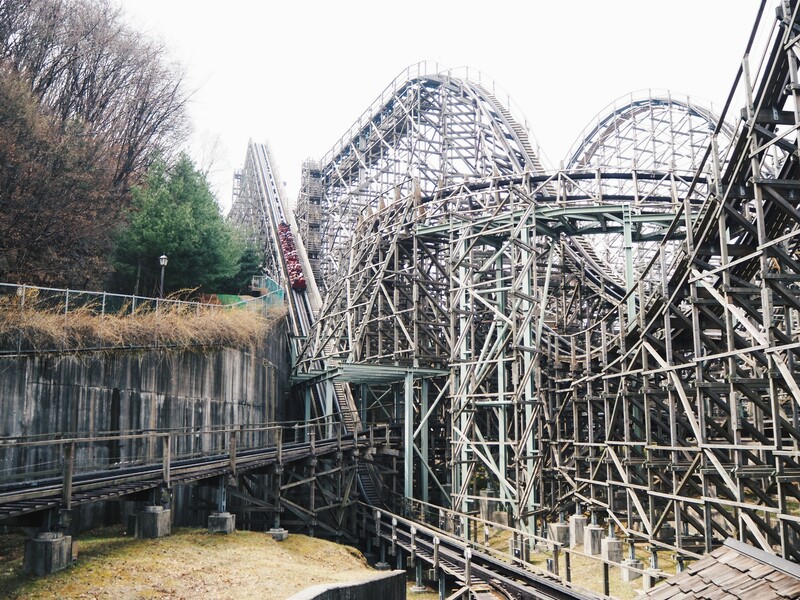 This behemoth of a wooden roller coaster has got to be one of the best ones I’ve experienced – and never underestimate a wooden coaster despite the lack of loops and corkscrews, you’ll be surprised at how the drops and turns are far more scary, complete with the thunderous roar of the car surging through the tracks. 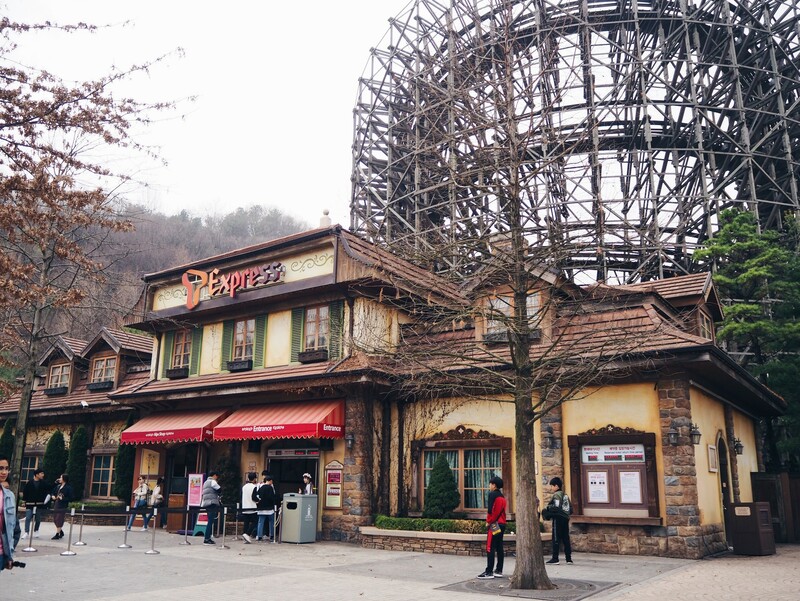 This one has the claim of the world’s fourth steepest wooden coaster, and South Korea’s first of its kind, with a top speed of 104km/h at a 77-degree angle. That bunch of math simply means you’re in for a ride you’ll want to hop back on after you’re done – though be warned, the queue can go up to 90 minutes without a Q-Pass (Everland’s FastPass reservation system). 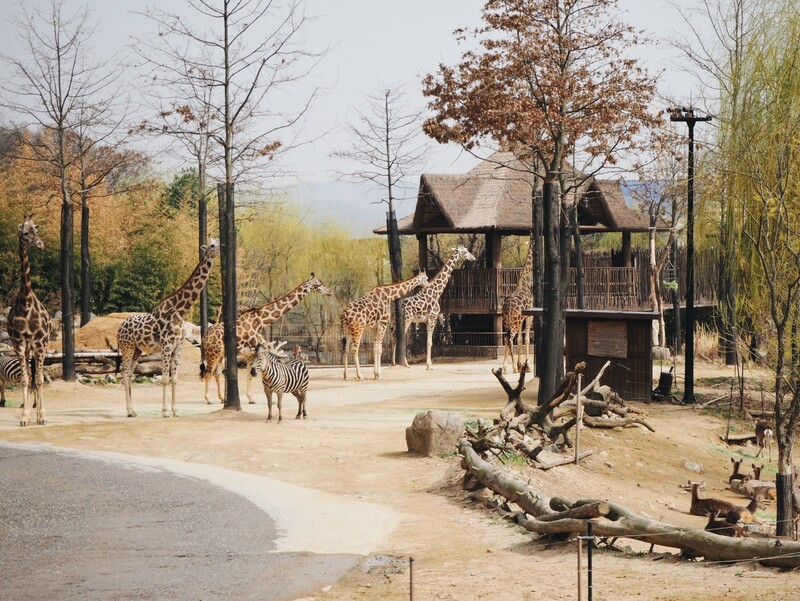 Everland’s also one of those rare theme parks with animals! 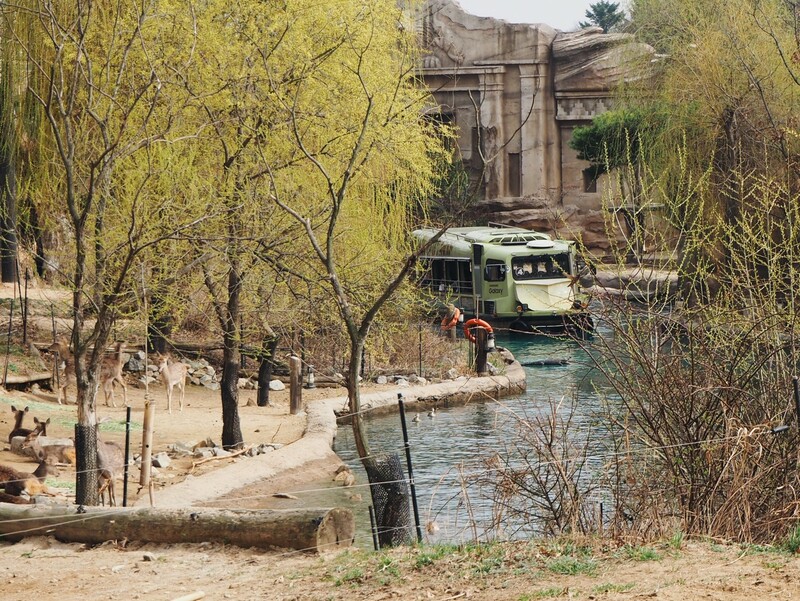 Hop on an amphibious vehicle at the Lost Valley attraction to spot giraffes and lions, or Safari World for lions, tigers and bears. The ever-popular Safari World attraction is when booking a Q-Pass comes in especially handy — you’ll save valuable time by not having to queue. You’ll get a timed slot in advance; approach the staff within that slot and you’ll be led to a secret entrance where you’ll be the first to board and get to choose your seats. What’s especially grand is the environment – you’ll feel like you’re in a safari, but better, since there are animals around every corner, making it a thoroughly enjoyable and immersive experience. 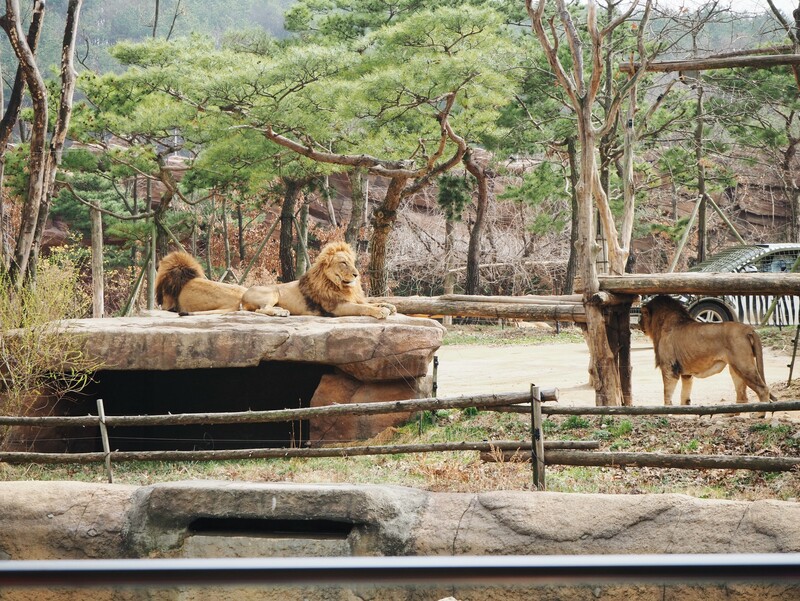 For Safari World, you’ll be seated in an enclosed bus, which gets you close to lions and tigers around every corner, sometimes crossing the road directly in front of you. 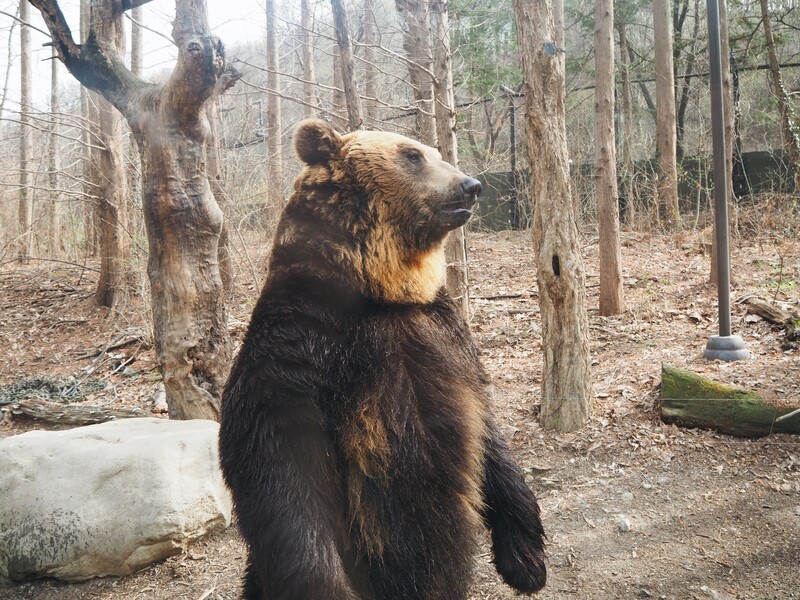 What’s most amusing are the large bears, especially cute for a large animal when they stand on their hind legs. At Lost Valley, the amphibious vehicle moves easily from water to land, where you’ll witness everything from elephants to camels to rhinos. 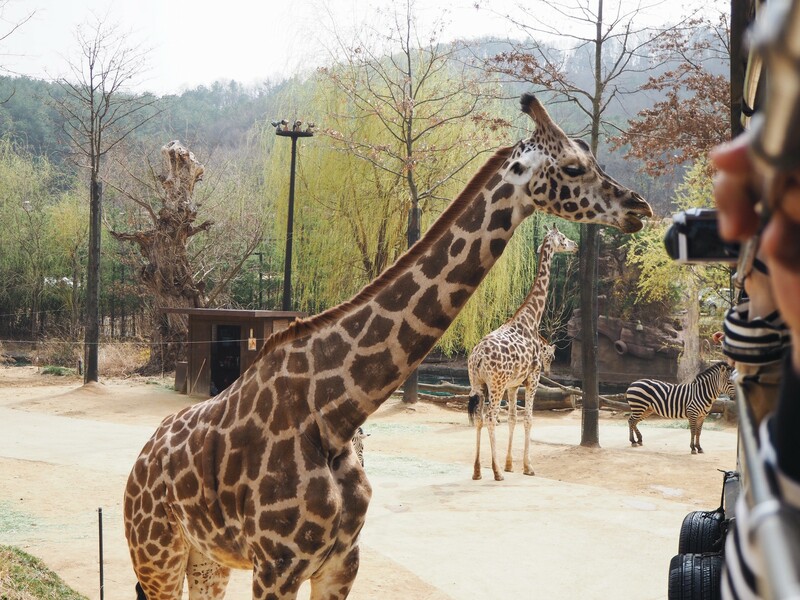 You’ll also be able to get really up-close to some of them, especially the giraffes who come right up to the vehicle. 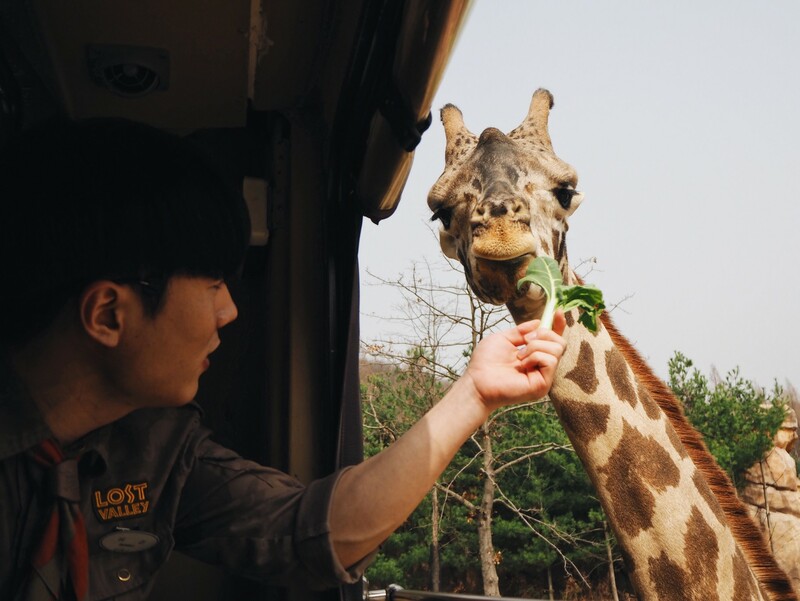 At one point, the guide even starts brandishing a leafy vegetable, which gets hastily chewed on by a curious giraffe. Definitely a different theme park experience, alright. Get your Everland Pass here ($47.10). And the Q-Pass here ($24.90). You can book a round-trip bus transfer here ($12.50). 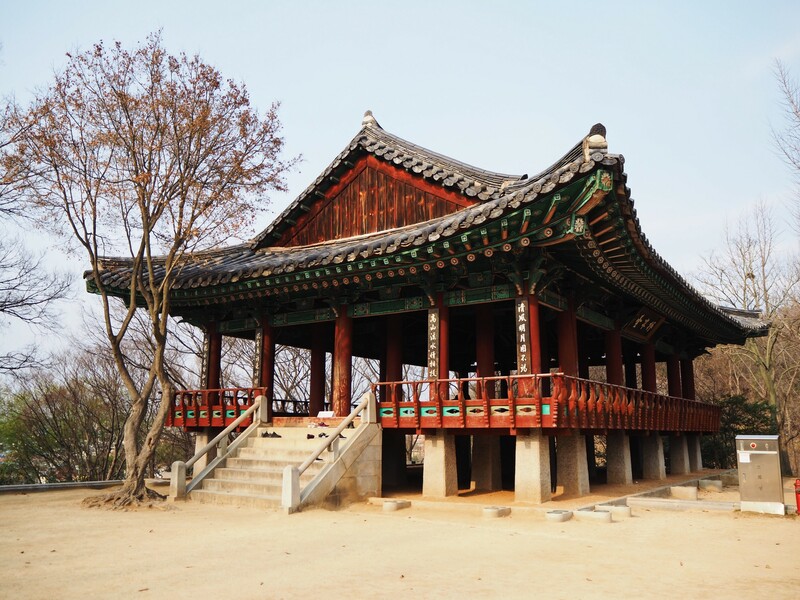 The journey is about 1 hour from central Seoul, and you’ll get guaranteed seats! The fastest and easiest local bus route would be bus No. 5002 from Gangnam Station (Line 2) Exit 10, which is a 1 hour ride too. Or, take bus No. 5700 at Jamsil Station Exit 6. The bus intervals are quite fast (about 15mins) though they’re usually packed, so you might end up standing the entire way. Bus Fare: 2,500 won, one way. 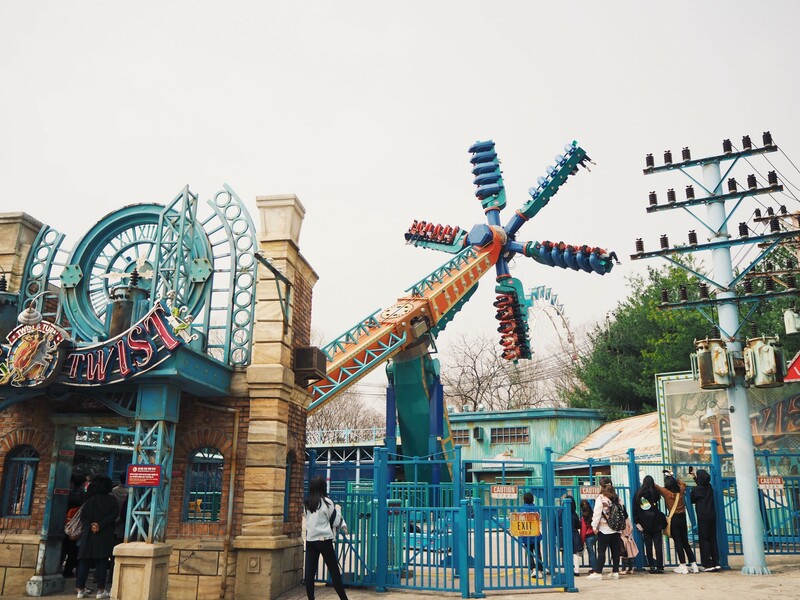 You’ll then arrive at the Jeondae Everland Station where you can take the free shuttle bus to Everland — it’s a short 5-min ride, but there might be some waiting time if there’s a crowd. From Gangnam Station (Line 2) – Jeongja Station (Sinbundang Line) – Giheung Station (Bundang Line, Yellow) – Jeondae Everland Station (Yongin Ever Line) Exit 3. Then, take the free shuttle bus to Everland. The estimated travel time is 80 mins. Do take take note of the EverLine operation hours too, 5:30am~11:30pm. 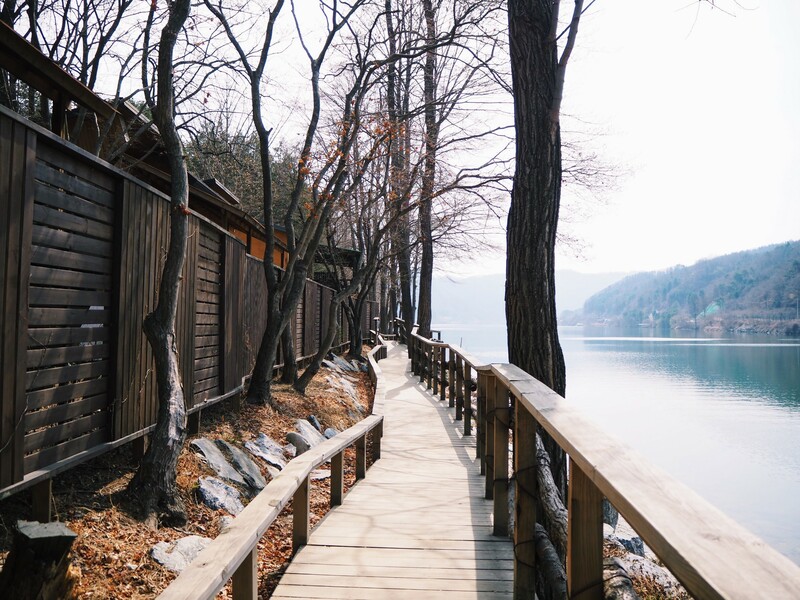 You can call that indecision, but what it really means is that you’ll get to have it all – Nami Island, Gangchon Rail Park and The Garden of Morning Calm, each with a different take on admiring nature. 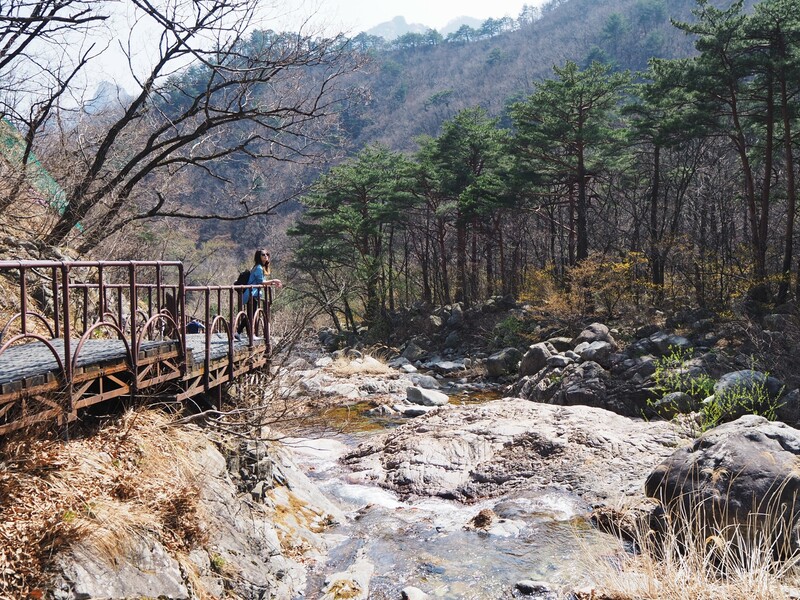 If you book a day tour to the destinations, you’ll get round-trip transport to and from, as well as in between, these Gapyeong highlights – the itinerary takes up an entire day but you’ll be duly rewarded. It’s perfect if you’re looking for some scenic greenery and the kind of calm you can only get away from the city. 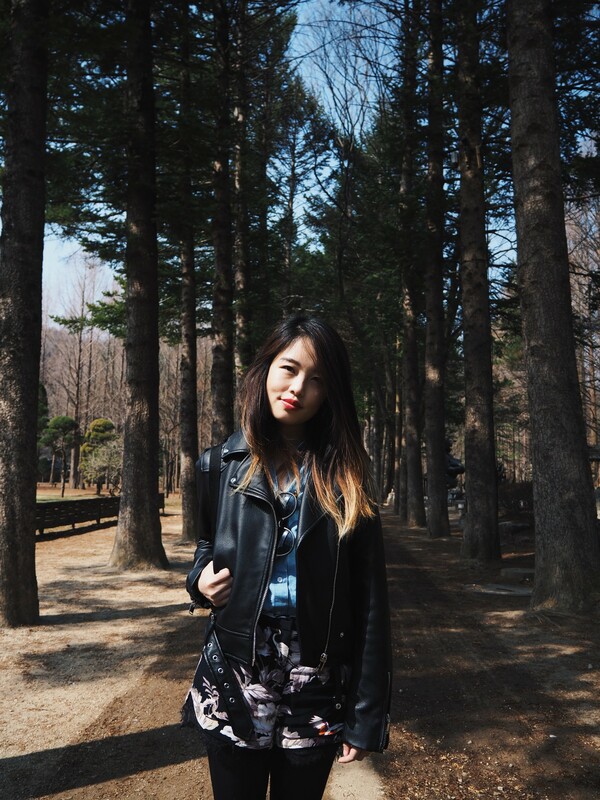 I started off the day at the picturesque Nami Island, a tiny half moon-shaped isle renowned for its romantic tree-lined paths, and for being the place where they filmed popular k-drama Winter Sonata. That makes the most sense if you visit during the winter months, in order to do the tourist 101 thing of recreating the iconic scenes, but hey, it’s just as beautiful during any other season. After a 10-minute ferry ride, you’ll find yourself in the middle of the park. 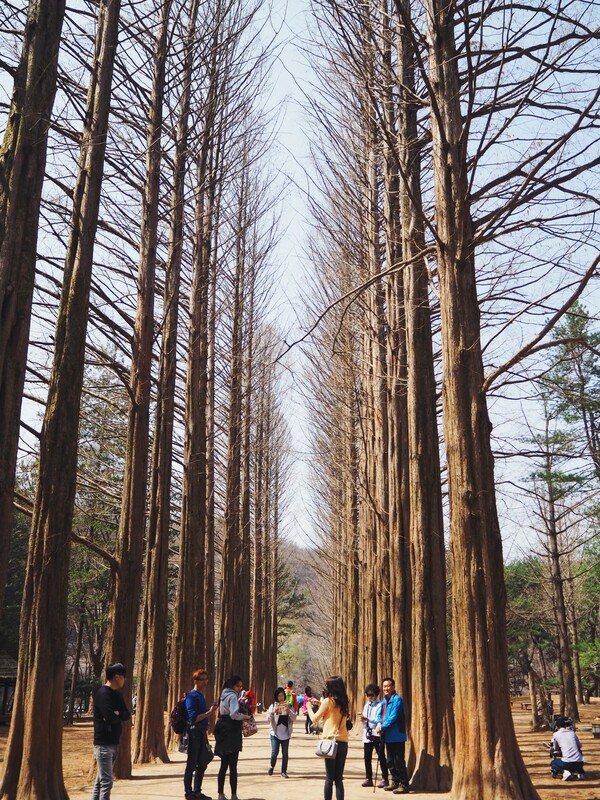 Lots of people, understandably, head straight for the famed Metasequoia Lane, home to this stunning row of trees that grow tall and straight; it’s an icon of the island, and also a key site for the romantic leads of Winter Sonata. Right beside that though is a row of Gingko Trees that look great in the Autumn with its sweeping yellow leaves. The Korean Pine Tree Lane, a central path that you’ll hit first before the other lanes, is also a popular spot to stop and take pictures at. What’s lesser-known, and arguably just as beautiful, are the lakeside paths. These are located further away from the main central areas, and are therefore less populated, making it far more serene. A fun option to get around the island is to rent a bike! You’ll easily reach the ends of the isle in no time, and discover gems such as a secret boardwalk on the Southwest side of the island, near Riverside Lover’s Gingko Tree Lane, or this wooden Hut Bridge near the tip of the Southside. 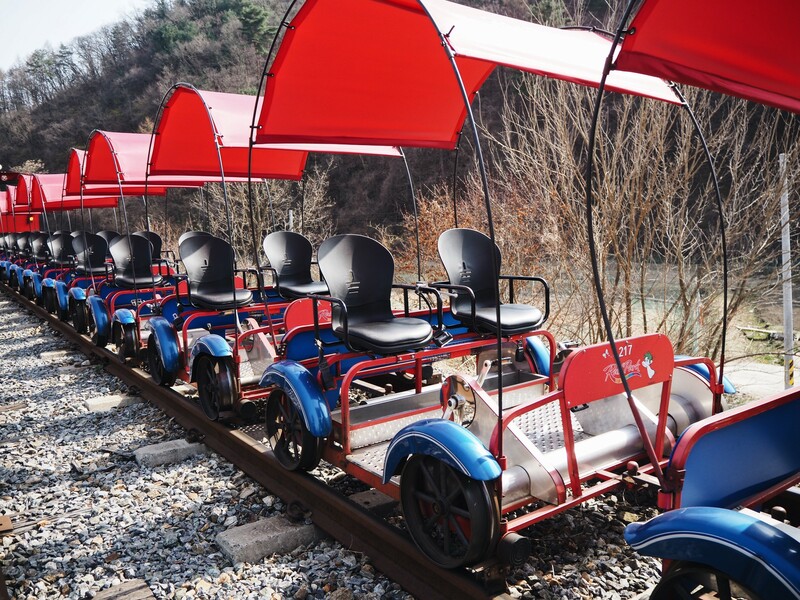 Next up in the itinerary is the more adventurous Gangchon Rail Park. 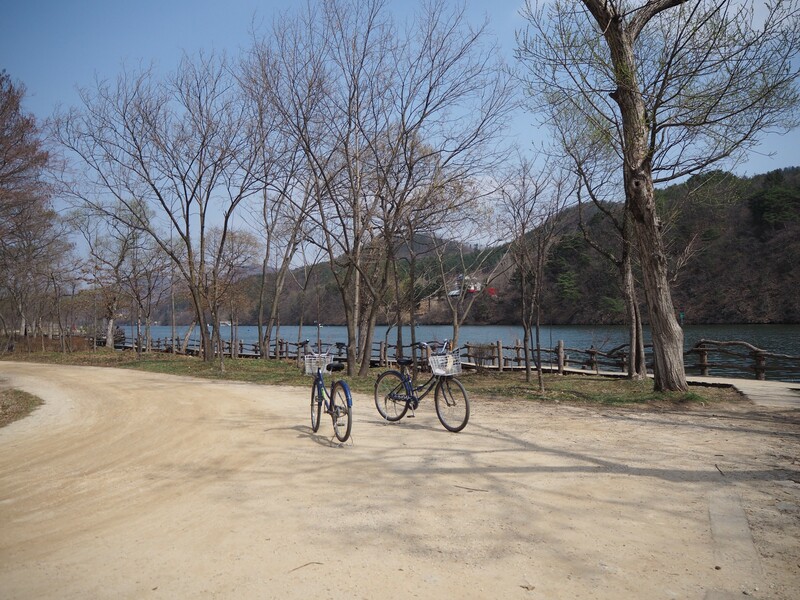 You’ll still get to experience nature, though this time, peddling your way through the beautiful Gapyeong countryside on these two or four seater bikes that run along old railway tracks. The entire course takes about 50 minutes, followed by a short romantic train ride. It’s an ingenious way to preserve the existing architecture of the land, while at the same time offering an experience different from long walks among the trees. Despite how it sounds, and hopefully with the aid of non-lazy friends, the course isn’t tiring at all, and is far more leisurely than expected. You’ll be greeted by the view of the Bukhangung River on your right, and even enjoy yourself going through the tunnels as they’ve jazzed them up with music and lights. 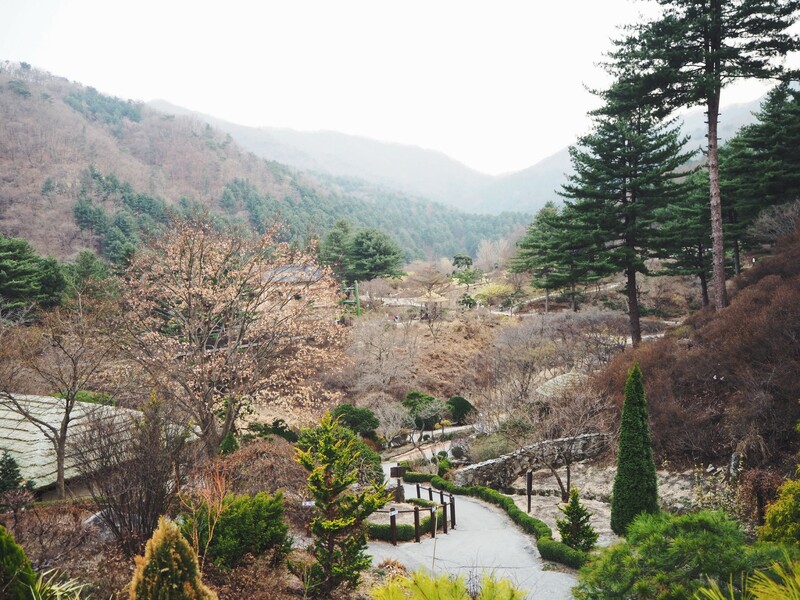 Our last spot of the day was The Garden of Morning Calm, an oasis of lush greenery and landscaped paths. 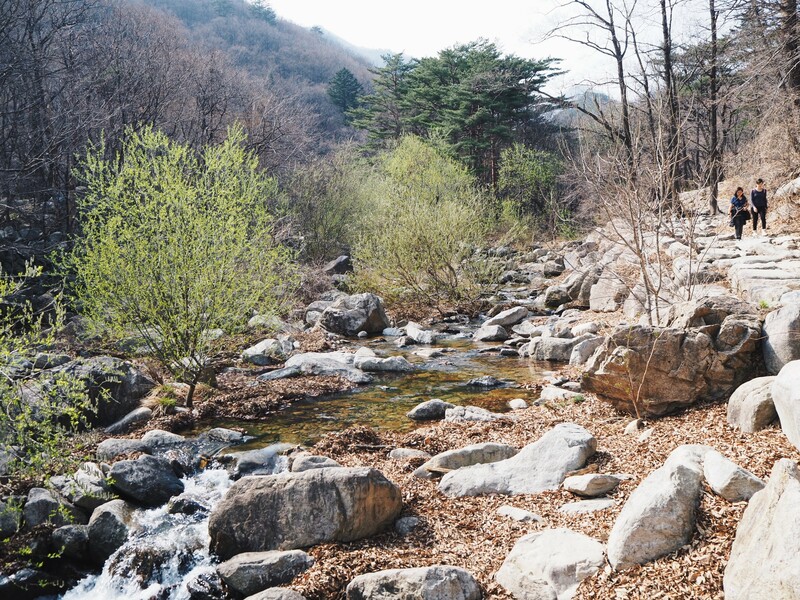 No kidding, there’s an air of serenity just being in this place, whose name was inspired a poem that described Joseon-era Korea as “The Land of the Morning Calm”. The 30,000㎡ private garden takes great care to present its flowers and plants in beautifully manicured lawns and walkways, with 20 themed sections including the Sukgeun Garden that’s shaped like the Korean Peninsula, meant to symbolize the hopeful reunion of South and North Korea. Visit during the different seasons and you’ll be privy to new sights each time – you’ll get a wide variety of blooms for Spring; for Summer, roses and hydrangeas abound, while chrysanthemums and warm-coloured leaves reign in Autumn; even Winter isn’t left out, as it gets its own lighting festival which comes alive and vibrant at night. Get a tour for all three highlights here ($97.20). This includes round-trip transport as well as the travelling between the locations, definitely way more worth it than sorting out your own transport. 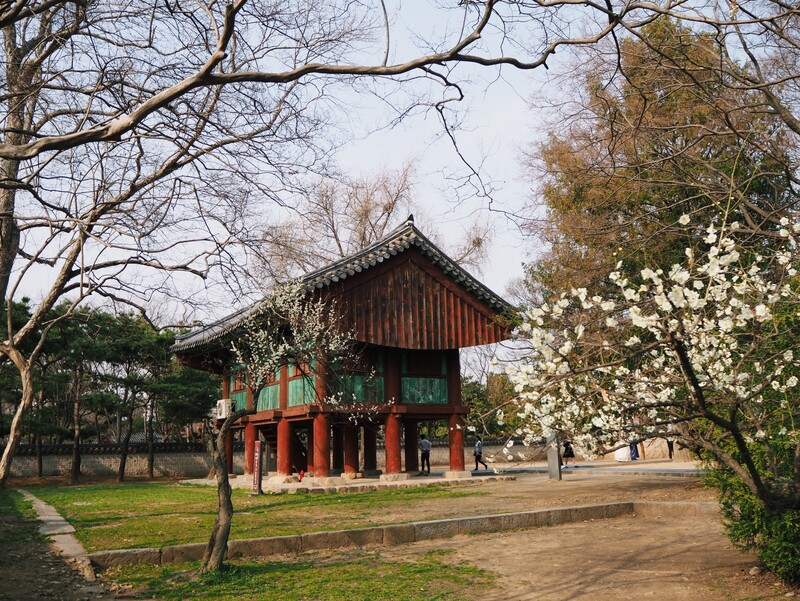 You can opt for pick-up at 3 popular spots: Hongik University Station, Exit 4 (Hongdae); Myeongdong Station, Exit 2; or Dongdaemun History & Culture Park Station, Exit 10. 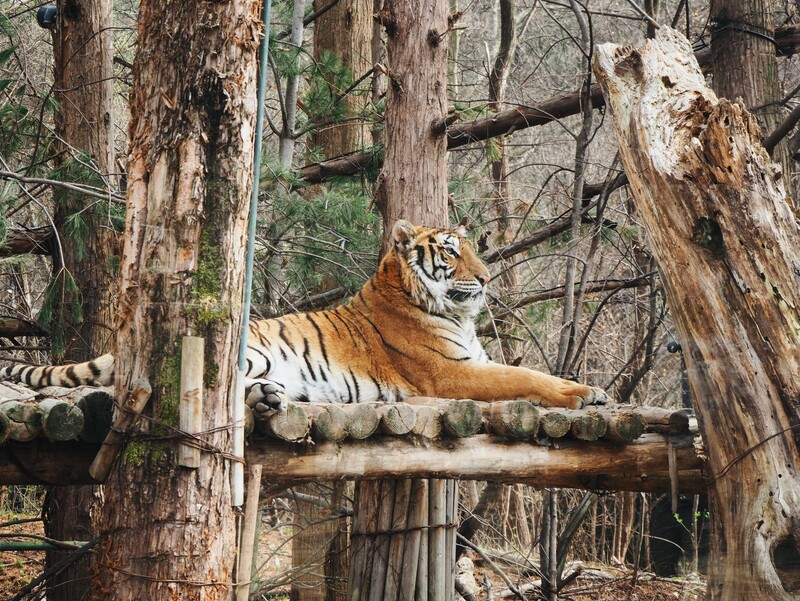 This lesser-known destination is gaining in popularity among the locals, due to both the lure of Seoraksan National Park, a popular hiking spot, and its sleepy seaside town vibes – with both, and how it’s mainly populated by locals, you’ll feel like you’re in a more authentic part of South Korea, away from regular tourist attractions. That said, the 2 hours 30 minute journey might sound daunting – the only way to get there is by an inter-city bus too, though I have to say, it was a very comfortable experience. The best way to explore the city is make it a weekend trip activity, and stay for at least two nights. 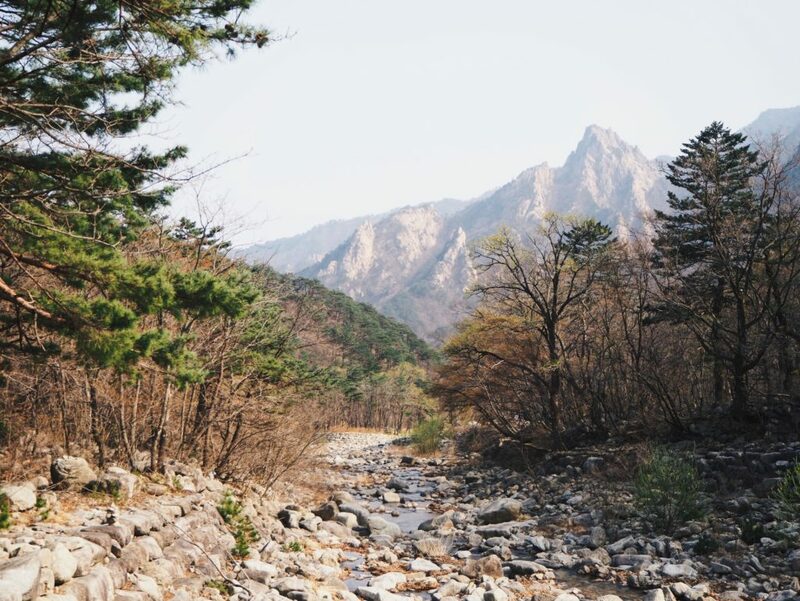 What you’ll wanna do is start your day bright and early with a hike up Mount Seoraksan, known for its mountain cliffs, scenery of flowers and trees, clear water streams and waterfalls, and interesting rock formations. Plenty of people rave about the Fall foliage as well, so you might want to head to Seoraksan National Park (2,500 KRW) during that time. I went on two easy/intermediate hiking trails that took up about half the day. Let’s start with the easy one – this involves a cable car ride (9,000 KRW) that’s located just a short distance away from the park entrance. That’s like 90% of the climb done for you to get to the peak of the mountain. 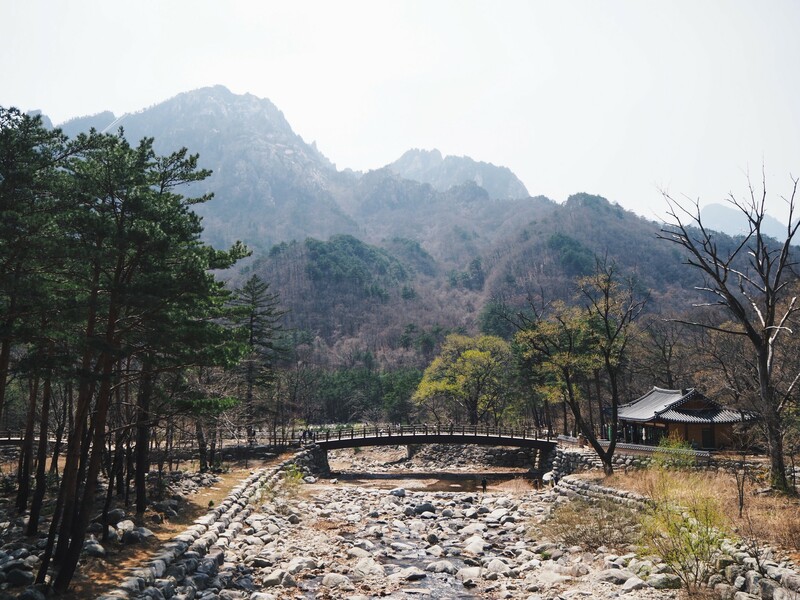 From there, it’s about 10 minutes to the Gwongeumseong Fortress, the site of castle ruins – you know it’s a leisurely hike when children are bounding across the rocks, and women in high heels are walking by you too. The winds though get crazy, probably from picking up speed through the mountain passes. For a more rewarding hike — one that you can boast about after because it requires effort – try the intermediate Heundeulbawi Rock Course, a 5.6km round-trip that takes less than 3 hours. It’s also said to be the best route to take during Fall, from mid-October to early November. 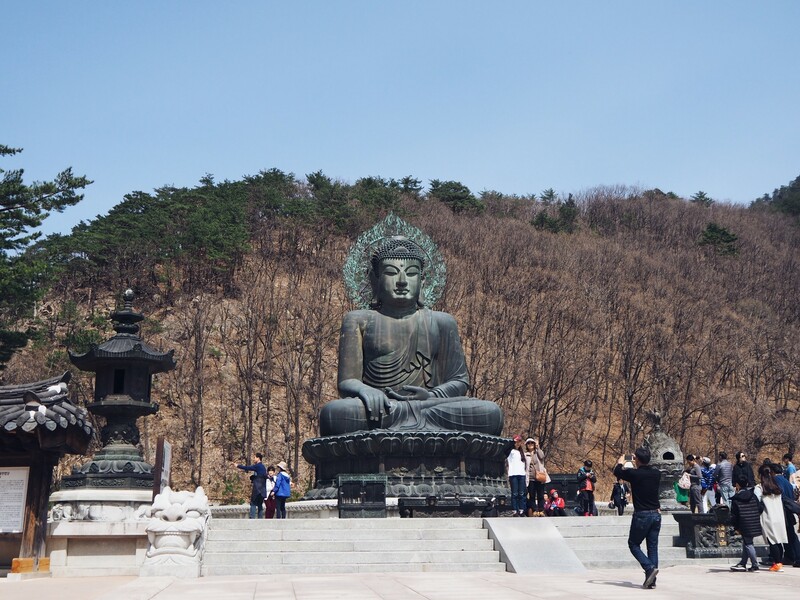 You’ll start off on a flatter route through the noteworthy Sinheungsa Temple, which houses one of the largest bronze statues on Korea, a 10m-tall one of Buddha, before ascending into more rocky paths. Still, nothing an ahjumma can’t conquer (though we have to say, they’ve got some great tenacity). Along the way, you’ll pass by ravines and streams, as well as lush foliage. 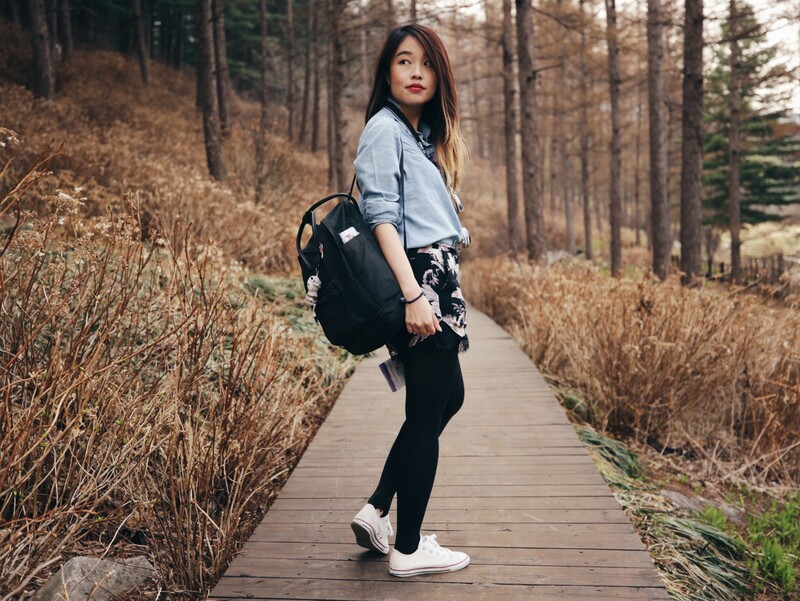 It’d be good to wear sneakers or hiking shoes, as your feet will be stepping over a naturally rocky terrain. 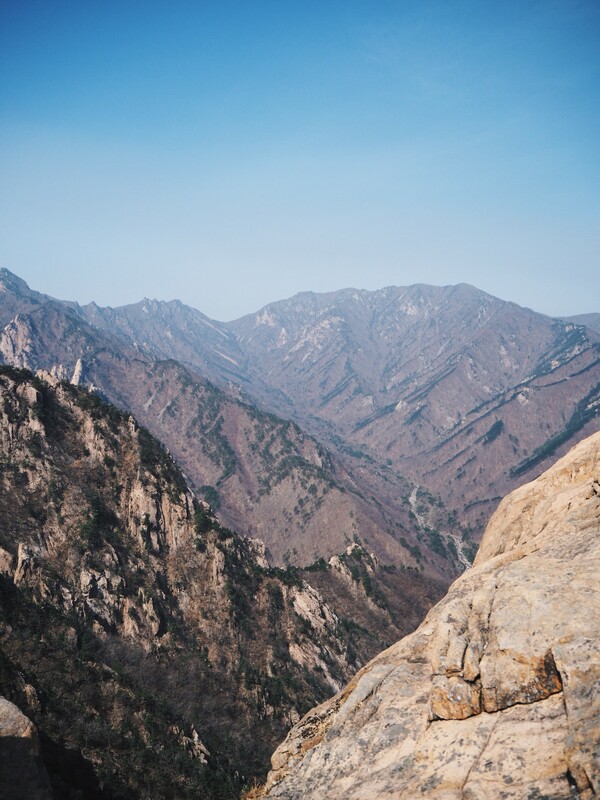 The ultimate goal here would be to reach the famous Heundeulbawi Rock, a spherical rock that people like to precariously rock back and forth. You can venture on for a more challenging trail, all the way to Ulsanbawi Rock, a unique structure of six granite peaks. 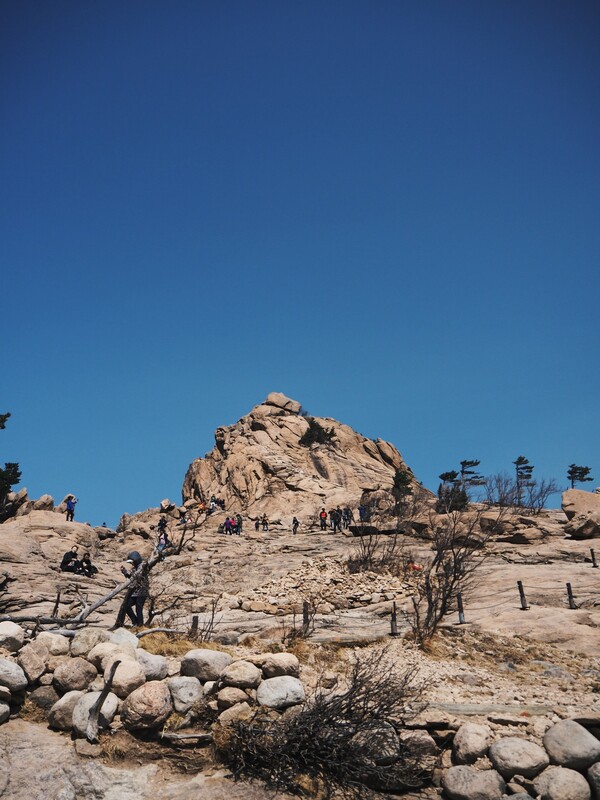 To reach there, you’ll have to climb over 800 steps though, many of which are pretty steep, though the panoramic views of Daecheongbong, Sokcho and the East Sea await you. When you’re done, reward yourself with some great seafood at the Sokcho Tourist & Fishery Market. I didn’t get a chance to go there (I know…), but I heard that the crab cakes and squid sundae, or stuffed squid, is a must-try. Plus, it’s a coastal town, you know the seafood will be incredibly fresh! 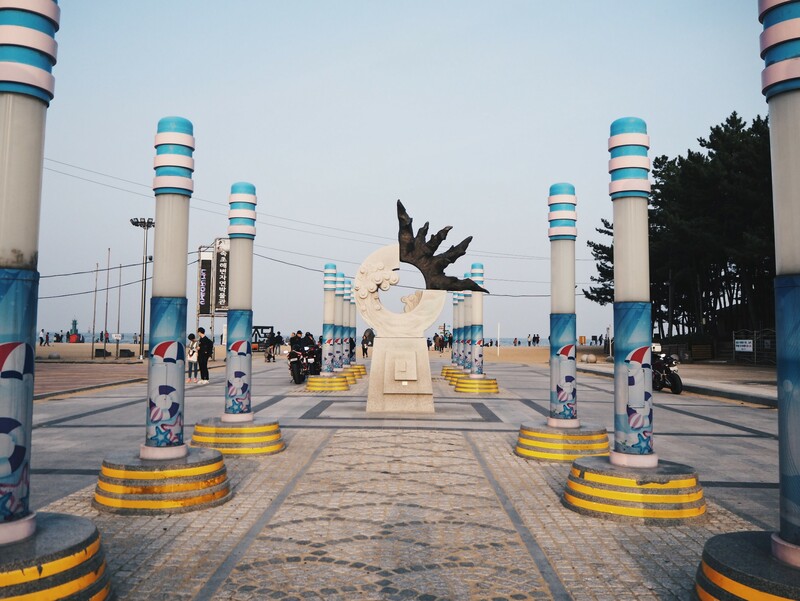 What I did get to do though was chill by Sokcho Beach. Maybe it’s magic hour, but there’s a serene 90s vibe to the area; you’ll get used to the sound of waves softly lapping up the golden sand. There are many families here just taking their children on a day out, or couples doing their romantic couple thing of long walks by the beach. There isn’t much to do really, but that’s quite a draw – to not have a tight itinerary so you can really relax and unwind. 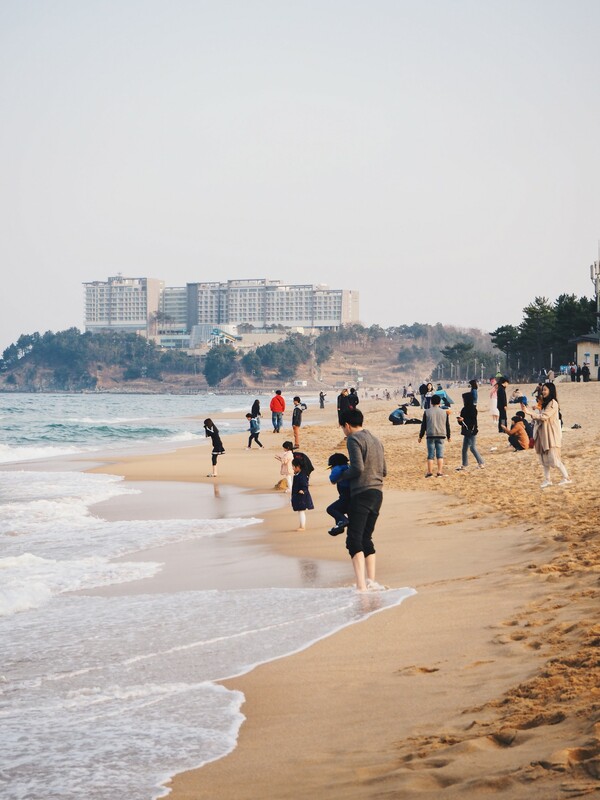 The most straightforward way is an inter-city bus, from Seoul Express Bus Terminal – Sokcho Bus Terminal, with a total journey time of 2 hours 30 minutes. Once again, book your tickets in advance if you can. The good thing is that these are comfortable seats that you can even recline in for a nap along the way. Buses operate from around 6.00am~11.00pm. Bus fare: 13,800~19,600 won, one way. Bonus! Okay this one’s really in Seoul, but quite a distance away from the areas of Myeongdong, Dongdaemun and Hongdae, at about 40 minutes away via subway. It is just a couple of subway stops from Gangnam though, at Jamsil Station. 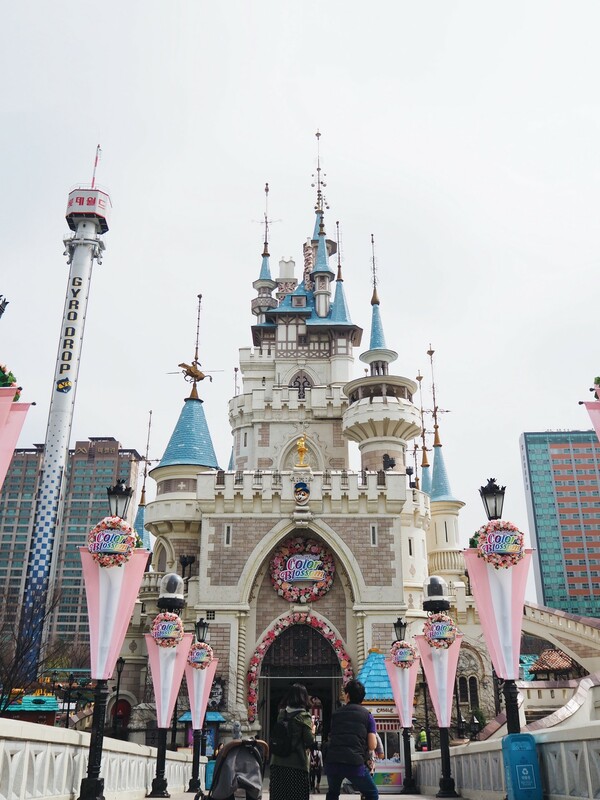 Still, the Lotte World amusement park is the “away from home” that’s actually “home”, and offers an adventure with both its indoor and outdoor theme parks. 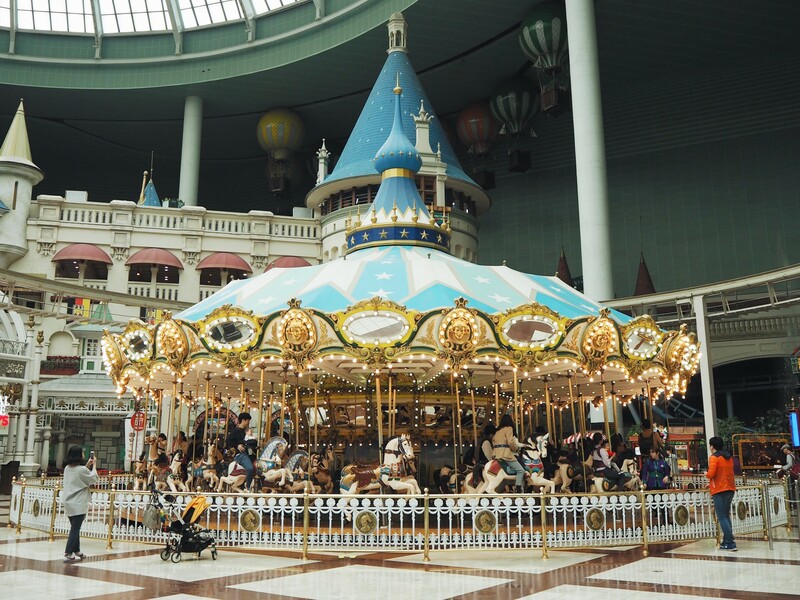 With a large indoor area, this means that the family-friendly amusement park’s perfect for any weather. 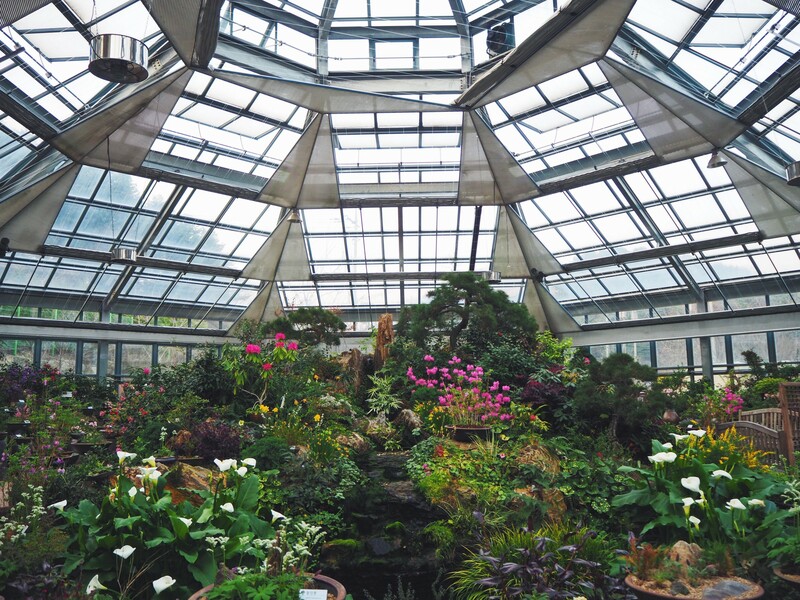 A huge glass dome covers the indoor space, letting in natural light, and there are 4 levels of food and attractions to explore. If you’re looking for some thrills, go for the French Revolution indoor roller coaster that’ll take you through high-speed tracks and a loop, now updated with VR headsets so it feels like you’re hurtling through space and blasting aliens too. 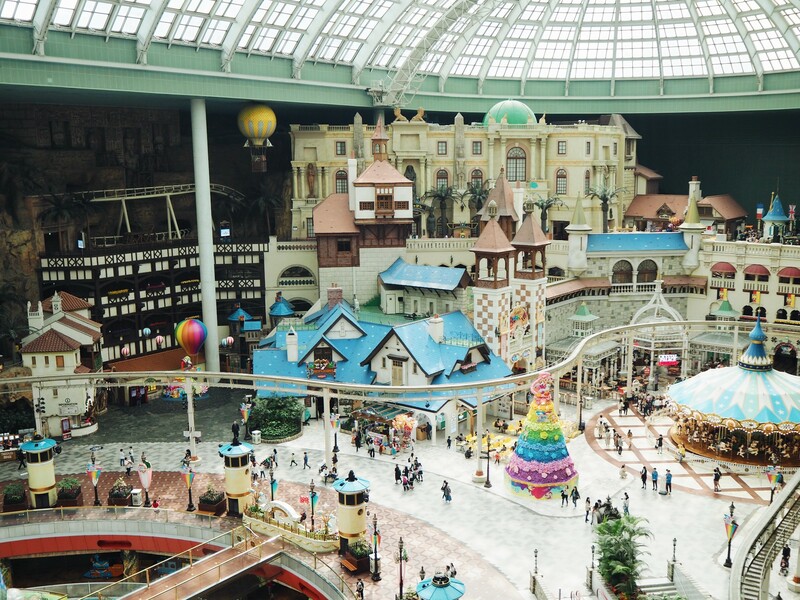 For the best view of Lotte World’s indoor amusement park, soar across the land on the Aeronauts Balloon Ride. There’s also a very photogenic carousel, a popular flume ride, and even bumper cars for variety. 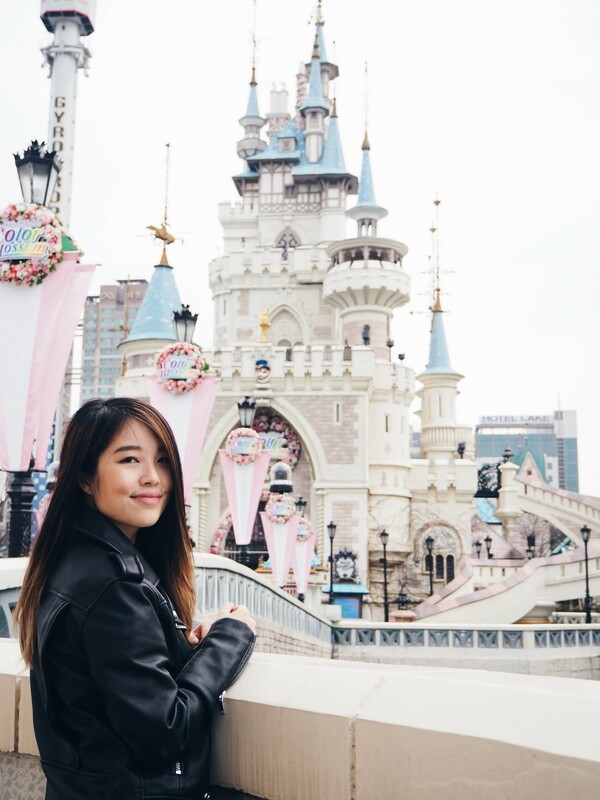 Then, head outdoors to Lotte World’s Magic Island, where you know you’ve arrived thanks to this spectacular castle, worthy as a backdrop for your IG. There are steel roller coasters, the space-themed Comet Express for instance with its rotating cars, and the ever-popular Gyro Drop ride, now with the VR experience too. If you can’t get enough of the word “gyro”, there’s also the Gyro Swing and Gyro Spin. Atlantis, a hybrid roller coaster and flume ride, looks like fun too, though it was closed for maintenance during my trip there. 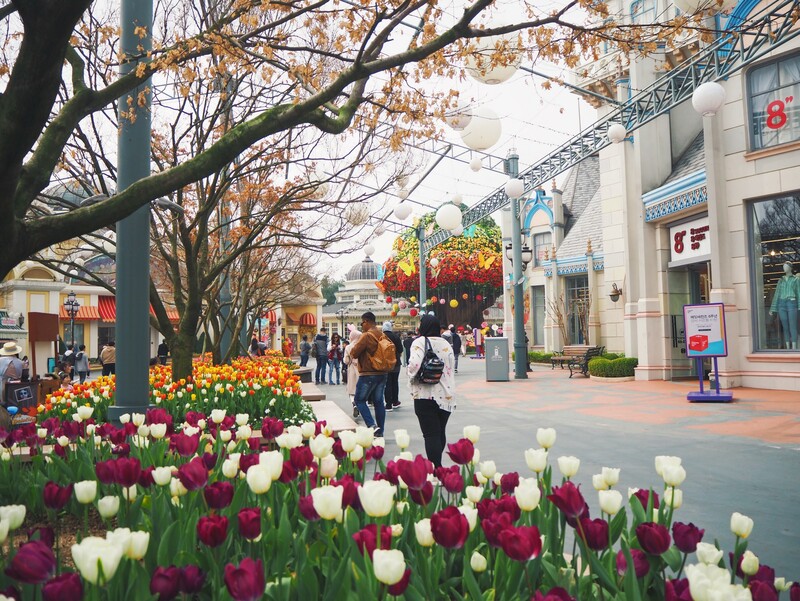 Good to know: the theme park is also located at a huge entertainment and shopping complex owned by the Lotte empire, so you can take your time to wander around in between, including visting the Lotte DFS where you can stock up on your k-beauty favourites. 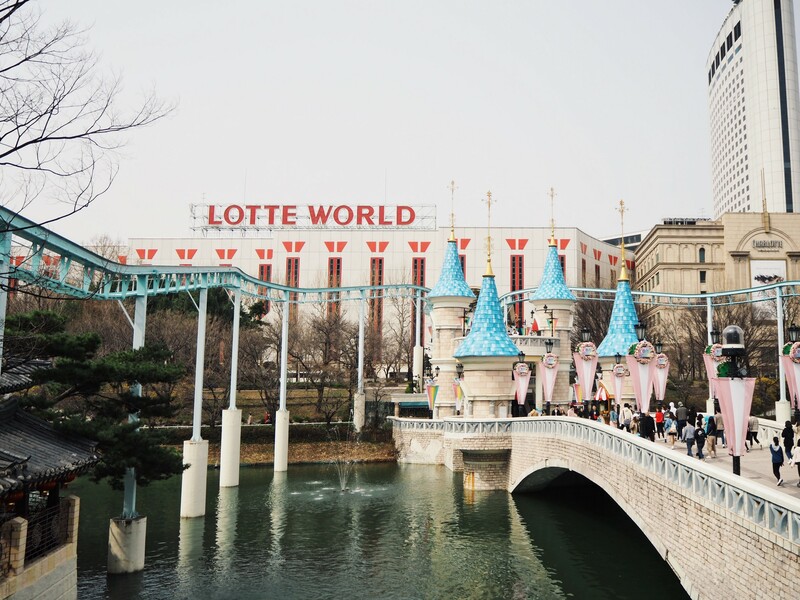 Get your Lotte World 1-Day Pass here ($37.10). Travel to Jamsil Station, Exit 4. 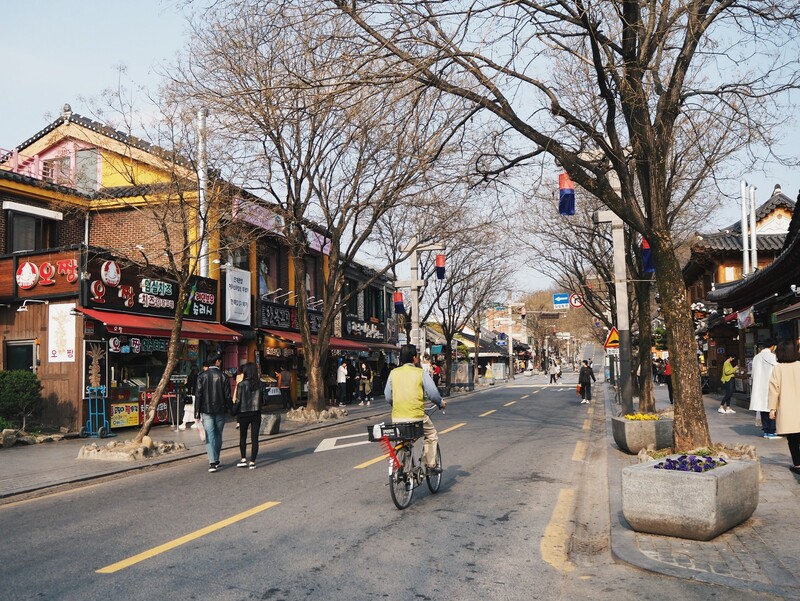 The ride takes about 40 minutes from Myeongdong Station. Look out for Klook’s exclusive summer promo! You’ll get $12 off a min. $150 spend with the code ‘YOURWAY’, and $50 off a min. $450 spend with the code ‘YOURWAY50’ (limited redemptions), available for all Klook activities. Valid till 30 June 2018, T&Cs apply. Book tickets through Klook and use our code “NYLON10” to get $10 off for first-time users!